BAC strives to provide opportunities for local, regional, and national artists to show their work through the “Artists at the Works” co-op group and various juried and curated exhibits. Along with that goal, BAC works to present a high quality and diverse program of art presentation for the public in Martinsburg, Berkeley County, and throughout the tri-state region. The Art Works has three display spaces. The front of the gallery is devoted to the “Artists at the Works” co-op group, which currently represents 13 local and regional artists and artisans. Media presented includes painting, photography, ceramics, glass, wood, and jewelry. Behind the co-op is what we call the “main” gallery and then we have a smaller space called the “Back Space”. The Berkeley Art Works is located at 116 North Queen Street in Martinsburg. Gallery hours are Wed-Fri 11-5, Sat 11-4. The Berkeley Arts Council is on the Web at https://berkeleyartswv.org/ or contact us at berkeleyartswv@gmail.com. 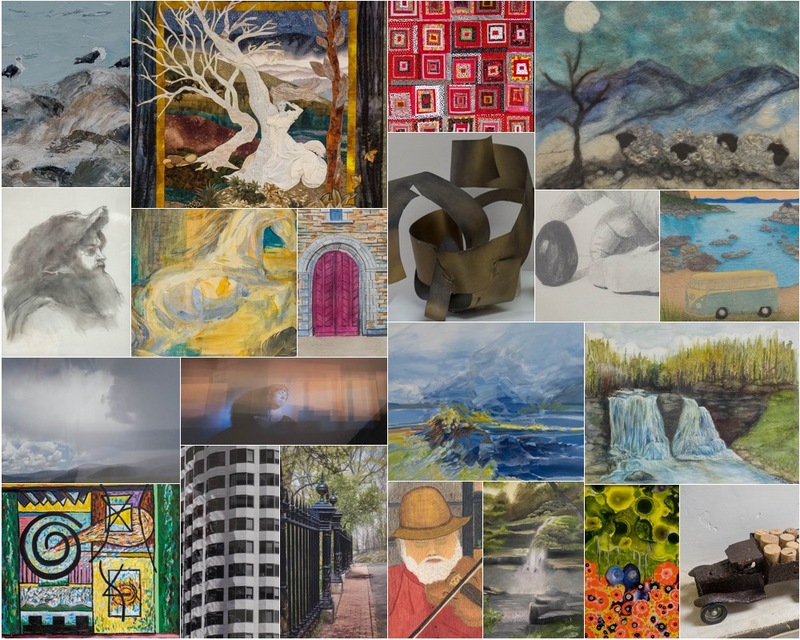 The Berkeley Arts Council announces the Ninth Annual Art and Earth Juried Art Exhibit. The exhibit has the theme ‘Art and Earth: My Art – My World’. Entries should reflect the artist’s view of nature, the environment, or reflect an Earth Day related theme. Any medium or technique, 2-dimension or 3-dimension, is acceptable. The exhibit will open April 3, 2019 in the Berkeley Art Works, 116 North Queen Street in Martinsburg. The exhibit will be on display through May 4, 2019. There will be a reception at the gallery on Sunday, April 7 from 2-4pm. The exhibition is open to all visual artists throughout the continental United States over the age of 18 in all media. Entries must be original works of art that have been completed within the last three (3) years, and have not been previously exhibited in The Berkeley Art Works. Juror: The juror for the 2019 exhibit is Jay Pastore, currently a design consultant to the Roberto Clemente Museum in Pittsburgh, Pennsylvania. 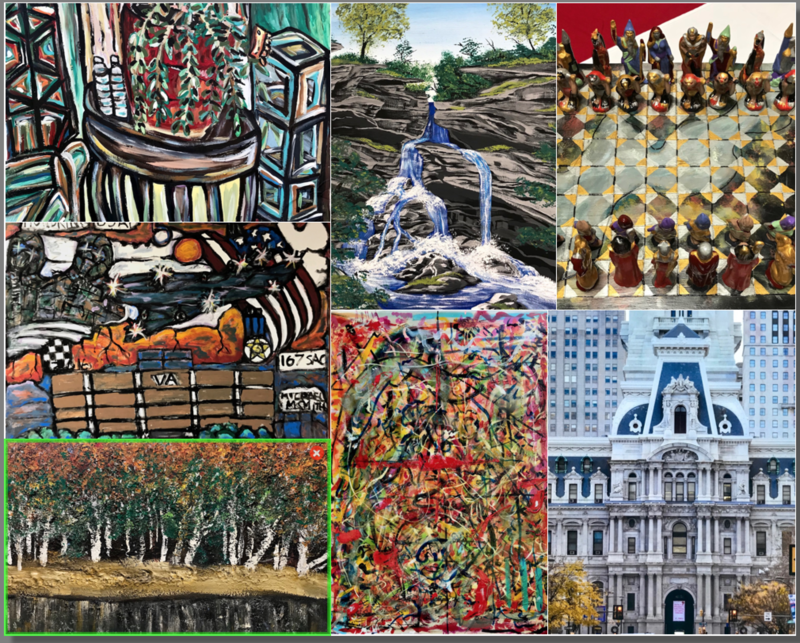 He previously served as the Artistic Director of the Rehoboth Art League, Rehoboth, Delaware, where he oversaw all aspects, from conception to deinstallation, of over thirty exhibitions each year. Entry fee: The entry fee for the exhibit is $35 for the first two works. Artists may submit one or two additional works for $10 each for a maximum of four works. Notification of Accepted Work: The notification announcing the juror’s selections will be sent by email and be posted on our web site (this page) on or about March 6, 2019. Awards: Best in Show $500 Total prizes $1,000. Berkeley Arts Council Members’ Exhibit is on display through February 23. If at first you don’t succeed, try, try again! Our January 13 open house was wiped out by the weather and the January 20 exhibit reception was limited by the weather so we are going to try again to get everyone together on Saturday, February 23. from 12-4pm at the Berkeley Art Works. This will be the closing day for he members exhibit and will be the last chance to view the exhibit and vote for your “fan favorite” award, which will be announced at the end of the day. It’s free and open to the public to to come in and meet some of the artists and Berkeley Arts Council Board Members. We will have information about the BAC’s programs, exhibits and classes, including new opportunities for artists and opportunities even for folks who are not artists but wish to find ways to support the arts. Gallery hours are Wed-Fri 11-5, Sat 11-4. Berkeley Art Works, 116 North Queen Street in Martinsburg. 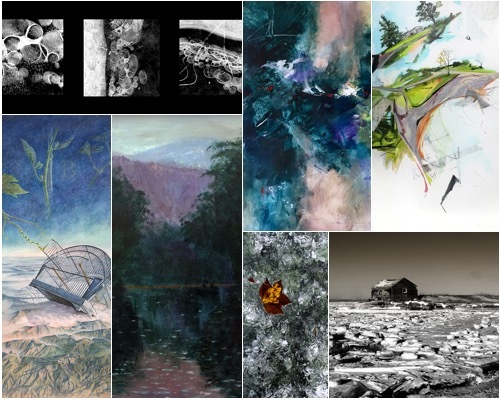 All artists who are members of – or who join – the Berkeley Arts Council are invited to exhibit one or two art works in the Berkeley Art Works gallery, January 16 through February 23, 2019. There will be a reception on Sunday, January 20 from 2-4pm. The exhibit is not juried. Any current member (2019) of the Berkeley Arts Council may participate in the exhibit. Artists who are not current members may join or renew online or at the gallery when the artwork is delivered for the exhibit. There is no entry fee other than membership dues. Participation in the exhibit is a benefit of membership. 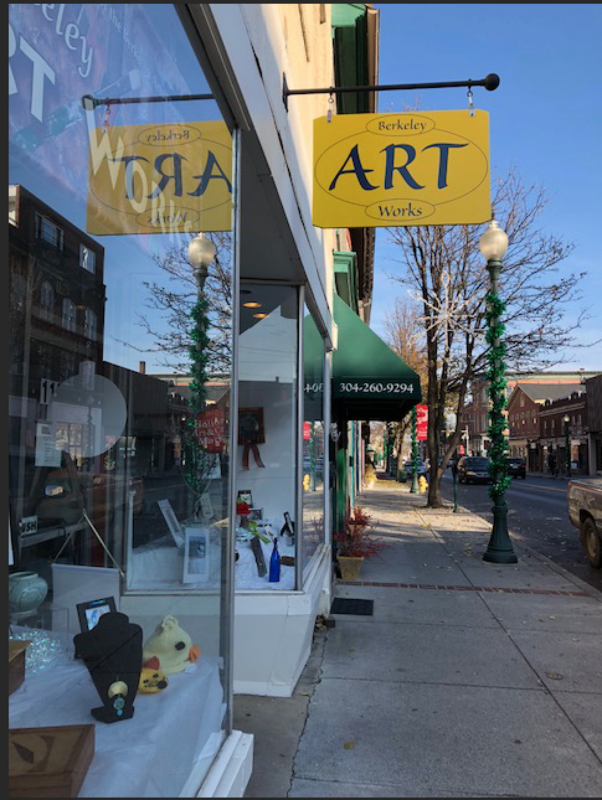 To participate, deliver one or two art works to the Berkeley Art Works, 116 North Queen Street in Martinsburg during regular hours on Wednesday, January 9 (11-5pm), Thursday, January 10 (11-5pm), Friday, January 11 (11-4pm), Saturday, January 12 (11-4pm), or Sunday, January 13 (2-4pm) during our Open House. Although the exhibit is not juried, work must be properly framed or otherwise well presented for display. Framed work must be wired for hanging. Three-dimensional fine art and fine crafts are welcome. An identification card or tag must be attached to each piece. If for sale, the tag must indicate the price of the work. The Berkeley Art Works will retain a 30% commission on sales of work in the exhibit. Please direct questions via email to berkeleyartswv@gmail.com or 304-620-7277. Membership applications are available in the gallery or online at berkeleyartswv.org/join-us/. 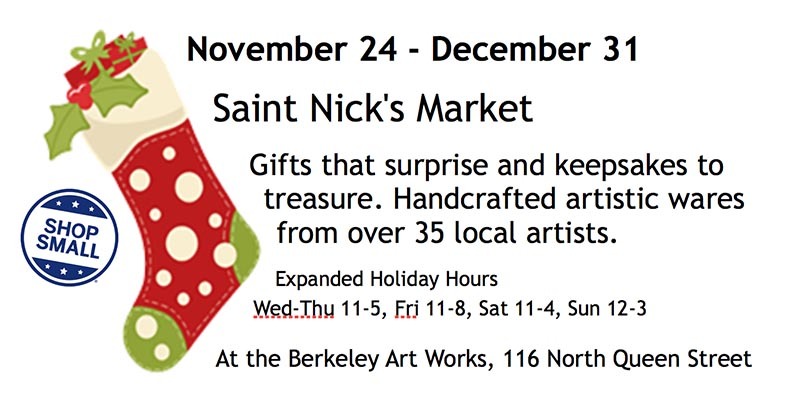 St. Nick’s Market Now Open! The Berkeley Arts Council has mounted a unique mixed media exhibition by regional U.S. Military Veterans to commemorate this year’s 100th Anniversary of the 1918 Armistice that ended World War I. 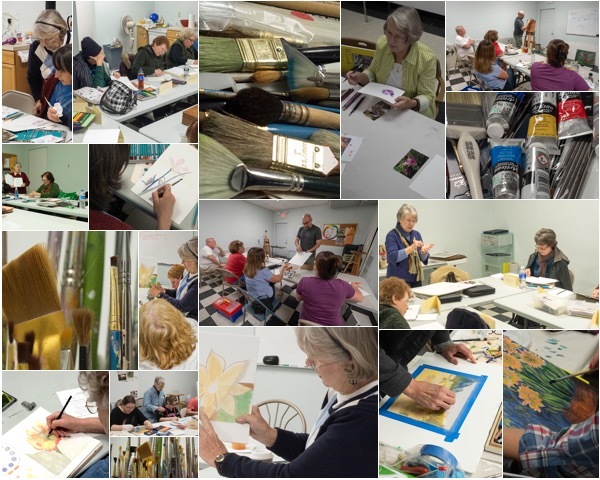 The 13 veteran artists included are or were part of the Healing Arts Center and Recreational Therapy programs at the Veterans Administration Medical Center in Martinsburg, WV. The exhibit is curated by Berkeley Arts Council artist Gary Bergel. Abu-Farruk Azhar, Preston Brown, Chris Chambers, Bob Hamill, Christopher Houck, James Jackson, Anthony Jones, Shawn Jordan, Jose Miranda , Howard Johnson, Doug Shuttlesburg, Johnny Williams. Paintings by Michael Smith, deceased, are also included in tribute to him and his service. Media included in the exhibit span oil and acrylic painting, mixed media, painted ceramics, photography, wood working, and memorial walking sticks honoring fallen comrades. BACKGROUND: There is an increasing awareness and appreciation for the therapeutic and healing possibilities found in creative human self-expression. Berkeley County, West Virginia, is fortunate to be home to a VA Medical Center with some of the most vibrant and effective art therapy and recreational therapy programs in the nation – evidenced by the Martinsburg Center’s winning entries in the annual National Veterans Creative Arts and Crafts Competition. “VERNACULAR” is a relatively new term that museum directors and visual art curators give to human creative work done for therapeutic, healing, and restorative reasons. It’s also sometimes called folk art, self-taught, naïve art, outsider, or outlier art. The creators may or may not be engaged with the professional, academic, or commercial art world.